Hello, my name is Bruce Goins and I am your guide at Goins Outdoor Adventures. Thank you for visiting my website. 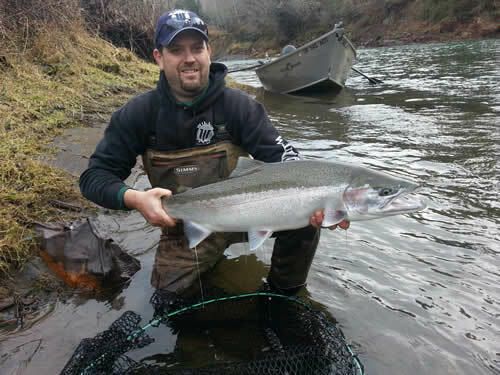 As an Oregon fishing guide, I specialize in fishing for Salmon Steelhead and Sturgeon. I offer drift boat and powerboat trips on the most popular Northwest rivers and bays. With over 25 years’ experience, I master several techniques which I will teach you during your next fishing trip to help you catch prize Salmon, Sturgeon or Steelhead. Salmon, Steelhead and Sturgeon Fishing trips available from the Famous Buoy 10 all the way up to the John Day dam in the beautiful Columbia River George. Salmon, Steelhead and Sturgeon Fishing trips available in Tillamook Bay, Nehalem Bay, Nestucca Bay and all the tributaries that flow into them including, Nestucca River, Wilson River, Trask River, Kilchis River and Siletz River. Salmon, Steelhead and Sturgeon Fishing trips available on Columbia River and Willamette River in the metro area. Salmon and Bottom fishing trips available when ocean conditions allow out of the port of Astoria and Newport. State of the Art open 25ft Willie Raptor with all the bells and whistles. This boat will fish up to 6 with plenty of leg room. It is powered by 3 motors a 225 Evinrude E-Tec main motor, 9.9 Yamaha Trolling motor with Auto Pilot and a Minn Kota 112 pound trust electric trolling motor. Everyone will be sitting in their own Willie captain chairs with arm rest. The boat is equipped with all the top of the line electronics and safety equipment to make your day on the water a safe and comfortable one. New Drift Boat for the 2017 Season: We had a custom 19×66 Willie Drift boat built to better serve our customers. It is both powered by 112 trust Minn Kota trolling motor and by ours. This boat will fish up to 3 clients comfortably with walk around seating, level floors, dry storage and much more.